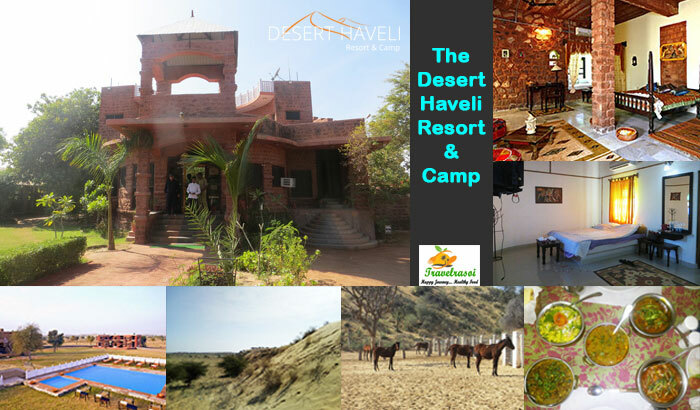 It was a long day at Jodhpur and after taking in the sights at Mehrangarh Fort, we started off to cover the 100 odd kilometres towards The Desert Haveli Resort & Camp at Sekhala. Throughout the journey, we waited in anticipation of the adventures that lay ahead. The view of the sun going down over the horizon served as a beautiful backdrop as we drove past windmills and vast barren landscapes. Soon we saw flashes of what we had waited to see for so long – the glimpses of the beautiful and serene desert scenery. We finally reached Sekhala at dusk. Once the construction of the 4-lane Jodhpur-Jaisalmer Highway gets completed, which is likely very soon, the roads are on the way to become smoother in the near future. 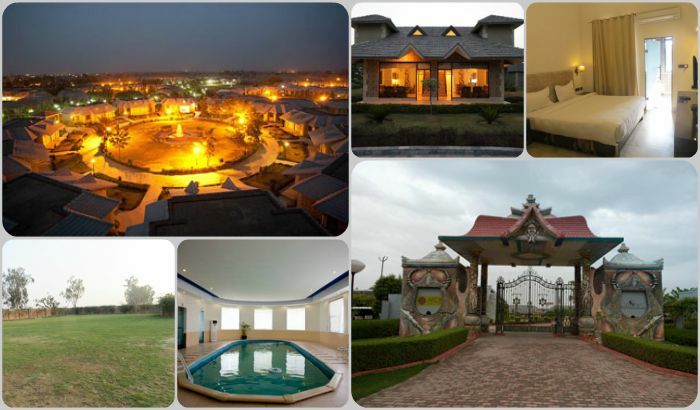 The Desert Haveli Resort is a beautiful property owned by Shri D. S. Inda, a native of Jodhpur. The Resort first started with the restaurant (named Haveli) in 1999, following which they started introducing rooms for accommodation. We were then led inside the resort through the restaurant. A welcome drink soon followed as we settled down inside. Rounak (R P Singh), the son of Shri Inda who manages the property greeted us while briefing us about the place and taking us around to have a look at the expansive property. We could not however meet Nirmal, Shri Inda’s daughter, who helped us with the previous booking and planning for the trip as she was away on a personal trip. Once inside the property, the hustle and bustle of the city was missing and the only thing that prevailed was serenity. There was greenery everywhere. A beautifully manicured lawn greeted us as we made our way to the rooms. 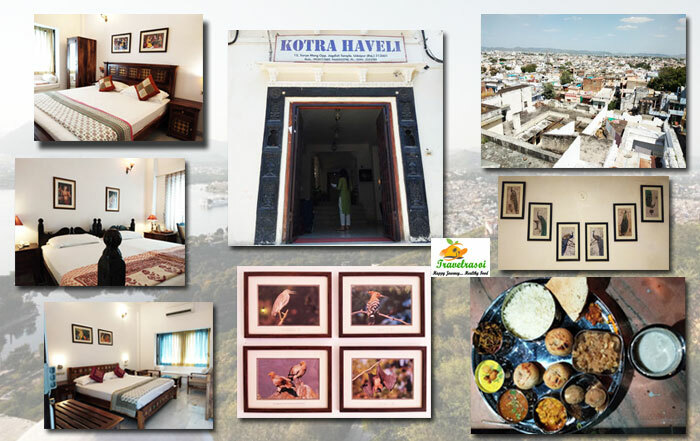 There is also a central reception area in between, tastefully decorated with traditional handicraft items and a cosy sitting area (baithak) where one could spend a quiet evening with a cup of tea. From just 4 rooms at the start of the Resort, it today houses a total 21 rooms, out of which 6 are Royal Suites and the rest 15 are Deluxe Rooms. The deluxe rooms are spacious, covering more than 250 sq ft, either in a rectangle or round shape. 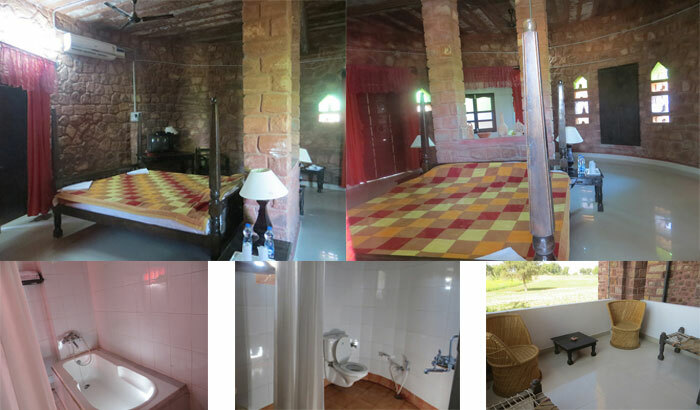 The cosy rooms are provided with an attached washroom with every amenity that a guest would need during the stay. With stone walls reminiscent of traditional Rajasthani architecture, the 550 sq ft suites exhibit the finest manifestation of Rajput architecture. 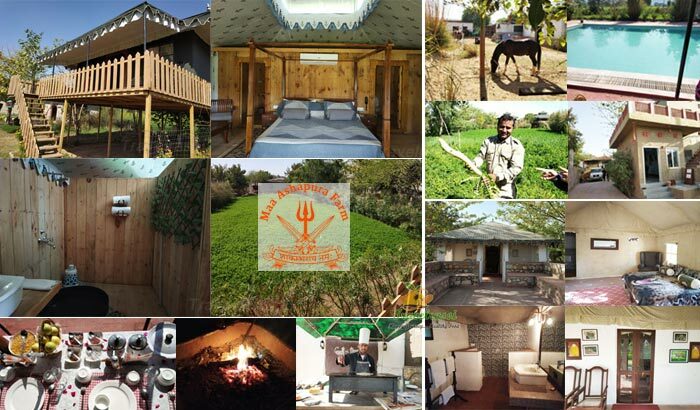 Every suite has an attached washroom and a sit-out area overlooking lush green mustard fields. The guests have access to all the modern amenities such as a king sized double bed, AC, room heaters, bath-tubs, tea/coffee maker, intercom and toiletries. We were fortunate to have spent a night each at both the deluxe room and the suite. A special feature in all the rooms is the private corner, kept secluded from the rest of the room and covered with beautiful drapes and decorated with bolsters and cushions. One could sit here spending some quality time with oneself. All rooms have a traditionally carved wooden door, similar to ones that adorn the old havelis (mansions), giving a touch of royalty. The royal suites and the deluxe rooms are built and placed separately in different complexes, making them look like a small neighbourhood. 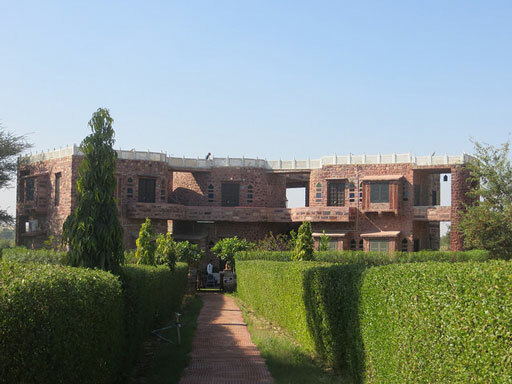 Each of these complexes with 3-4 rooms each has its own individual garden area, surrounded by a boundary wall and a small gate. We got up early the next morning to take a stroll around and see the things we have missed the previous night. At one corner we came across the spa and the swimming pool that are built as a recreational facility for its guests. The Resort also has 1 meeting room that can host Business Meets and Conferences with up to 100 attendees. The Souvenir shop located inside the Resort houses a wide collection of ethnic Rajasthani gift items to bring back as mementos of this wonderful place. A special mention needs to be made of the staff at the Resort who is equally hospitable and friendly. We were still busy inspecting our rooms on the evening we arrived, when a boy from the staff walked in with a tray and served us hot tea, sandwiches and pakodas (besan fries), the latter which we did not even order for. Also since we were in a group we had larger demands, but the boys without any complain offered to help us with whatever we needed, even at odd hours at night. They even helped us with a special looking birthday cake just before 12, when we were celebrating the birthday of one of our friends in the group. We were full of praises later for this hospitability shown. 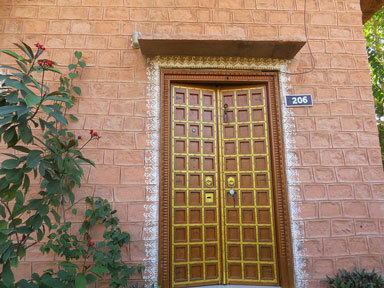 The restaurant, Haveli can accommodate close to 50 – 60 guests at a time and serves special Punjabi and Rajasthani food. The options of both a la carte and buffet are open to a guest. The speciality of the Haveli kitchen is that the food is prepared from fresh farm vegetables which are cultivated in their own farms. Their farm also houses close to 60 cows that provide for all the dairy requirements at the Resort. One of its other specialities is that the food is cooked on traditional chulha (using firewoods), which however is not very popular among Indian guests but foreigners have taken a big liking to it. 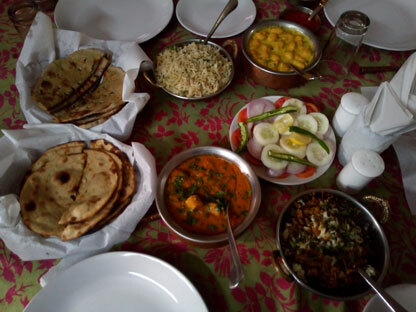 As keen food lover, we could not have kept ourselves away from Rajasthani food while in Rajasthan and so when the time for placing the order for food came, we ordered for a traditional Rajasthani meal. We were treated to a sumptuous Rajasthani meal during lunch which consisted of Ker Sangri, Gatte ki sabzi, Kadi chawal, mung dal ki vadi ki sabzi and bajre ki roti with ghee and gur (jaggery). 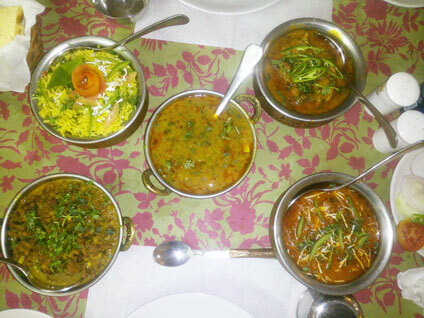 Besides Rajasthani, the restaurant also takes pride in serving special Punjabi and other North Indian food. In another meal of ours, we had the chance of dining on its special Country Chicken curry, paneer ki sabzi, aloo ke parathe and dal makhani. The best part about their food is that they took special care of not to give a miss to its quality. The food is also light and not very spicy and oily. On the next day of our arrival we took the jeep safari that came out as yet another surprise for us in the package. A Jeep arrived to take us for the ride and we all hopped in to go and experience Rajasthan’s desert life of the villagers living close by. 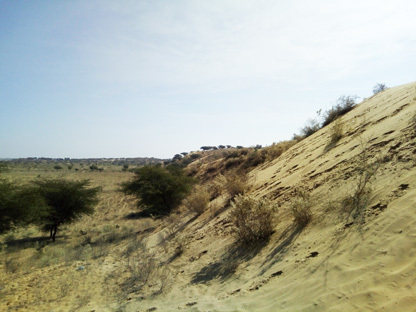 As a means of recreation, the Desert Haveli conducts this 2 hour long jeep safari that takes its guests for a ride on sand dunes and to nearby village. Also included in the itinerary is a visit to the Resort’s horse breeding farm, where close to 72 racing horses are bred. The next stop is at their local farm to familiarize the guests with organic farming that is practiced to cultivate fruits and vegetables without the use of fertilizers. Close to the farm is the community temple dedicated to Jalandharnath Gogadev. It is a beautiful temple, built on a ridge that overlooks the villages and the mustard fields below. The Shiv temple here is around 100 years old, but the rest of the temples in the premise were built much later. Devotees are not allowed to enter the main temple but are asked to pay their homage from outside, which is I think is a good thing from the cleanliness point of view. We were lucky to have paid a visit to each of these places before making our homeward journey to the Resort. Additionally, the safari also includes an off roading trip, which we did not of course take since we had kids. The trip has been especially designed for youngsters who would love to take a ride on the rough desert terrain and dunes. 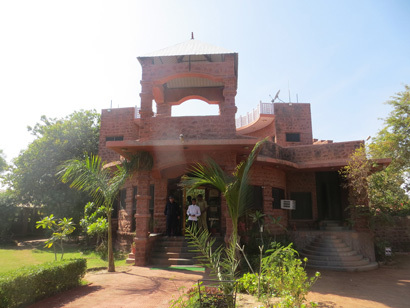 Share the post "Royal Rajasthani Heritage comes alive"
I visited Desert Haveli Resort in February this year with my family. It was great experience there. As we entered the resort a warm welcome by the hotel staff with soft drinks. Great hospitality ,superb ambience was very much homely environment. Fresh green vegetables grown in their own farm just backside of resort , cooked and served at their restaurant gives a true Indian cuisine taste. The desert safari with the camel ride was a great experience. Excellent service and hospitality never let us felt as a hotel. All over we enjoyed a lot there. Definitely we’ll be back again for a great holiday vacation. Hi, I love rajasthani food. 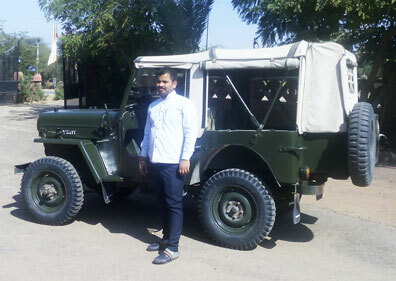 Last year I was visited some places of Rajasthan. What a beautiful state in India.!! Wonderful memories.!! I love rajasthani people also. They are humble, kind and caring.